The mayor of Madrid seems to have hinted the policies of US President Donald Trump are reminiscent of those of Adolf Hitler, without naming the notorious Nazi dictator directly, but mentioning the "terrible genocides" of World War II. 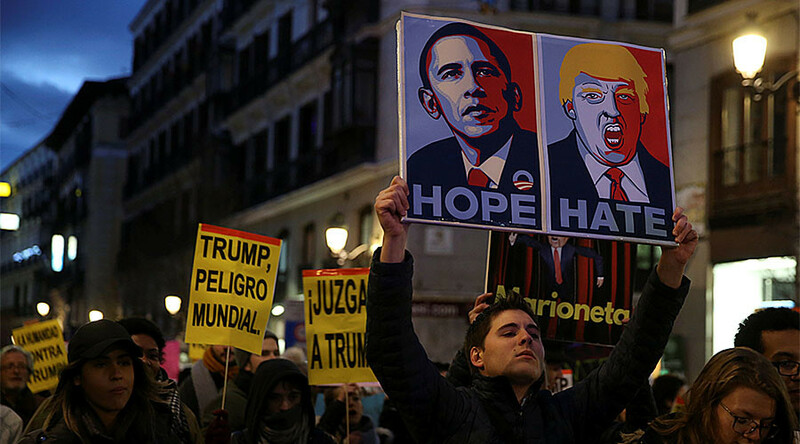 "We know that his [Trump’s] government has been legitimately elected and has the popular support of a large number of citizens," Madrid Mayor Manuela Carmena said on Monday while speaking at a council plenary session. "But in the 20th century we experienced one of the greatest violations of human rights by a government that also initially enjoyed support from many citizens,” she said, in an apparent reference to Adolf Hitler and the Nazis. Carmena did not directly name the dictator, but earlier in her speech she had mentioned humanity's regret about the "terrible genocides" that took place in Europe during World War II. — Ahora Madrid (@AhoraMadrid) 30 января 2017 г. US President Trump signed an executive order on Friday banning citizens from seven Muslim-majority nations, including Iraq, Sudan, Libya, Somalia, Yemen and Iran, from entering the US for at least the next 90 days unless they possess a diplomatic visa, and barred refugees from Syria indefinitely. The order immediately prompted protests against Trump’s ‘Muslim ban’ across the globe, with rallies continuing in some places. “I find it difficult to take the floor for a council plenary session without first making reference to the protests that have taken place across the world against the human rights violation being carried out by the current president of the United States," Carmena said. The mayor later took to Twitter, denouncing Trump’s policies. “Sometimes silence is guilty,” she wrote. — Manuela Carmena (@ManuelaCarmena) 30 января 2017 г. Since the implementation of the travel ban, a number of world leaders have reacted with condemnation and concern, saying that it violates democracy and humanitarian principles. Spain, however, has so far kept silent. In the meantime, Carmena’s remarks did not amuse Esperanza Aguirre, a former minister and regional president of the conservative Spanish People's Party (PP), which currently holds the most seats in the country's congress. Aguirre is the present PP spokesperson in Madrid City Hall. “You may like Trump or dislike him, and there are many things I do not like, but to give him lessons in democracy from Europe, where the worst totalitarianism in history has been born, both the Nazi and the Communist... seems to be absolutely and totally rejectable, and I want to do it with the utmost force,” she said.